I am, as I write this, 52 years old and, thank G-d, in good health. I estimate that, between work, family, scouts, writing, and sleep, I probably have time left to read about 1,000 books in my life, at the very most. Confronted with that figure and the realization that my library already has thousands of unread volumes, I have by necessity become quite picky about my reading. One filter I have added to my quest for erudition has been the resolution to avoid writers who were openly anti-Semitic, or who had the reputation of being so in their private lives. For these reasons, I will not be spending any more of my increasingly precious hours reading the works of T.S. Eliot, Roald Dahl, Louis-Ferdinand Celine, Edith Wharton, Kingsley Amis, Ezra Pound, GK Chesterton, or others similarly biased. People I respect tell me that in doing so, I am closing off a large and important swath of literature, and that is true, but only to a limited degree. When I was younger I read widely, and I spent time with the works of many of these authors. I’ve sampled the wares, as a good reader should, and I would never urge my son or any other student to shy away from any author because of their beliefs. But the resurgence of anti-Semitism in the world today makes it necessary to filter out what I can. What is more, I am blessed in this age to have access to such a massive scope of works that I can readily go through life avoiding anti-Semitic writers (and any hatred that might seep into their words) and still have a full literary life. And, oh, the choices make it simple. I shan’t miss GK Chesterton when I’ve yet to sample the oeuvre of Primo Levi. Why bother with Kingsley Amis when Bernard Malamud beckons? And do I need bother with Roald Dahl beyond Mr. Wonka when the late Elie Weisel’s Souls on Fire and Night both taunt me, unread, from my bookshelf? And that’s before I even bring up Martin Buber, Adin Steinsalz, Abraham Joshua Heschel, and the raft of brilliant sages dating back to the Rambam, the Ramban, Rashi, and beyond. You get the point. It is hard for a quinquagenerian Hebrew to justify spending time on anti-Semites when so many great Jewish authors and works lay waiting on the shelves. If I will be a biscuit more observant at 53 than I was at 23, Chabad of Beijing gets a massive chunk of the credit. 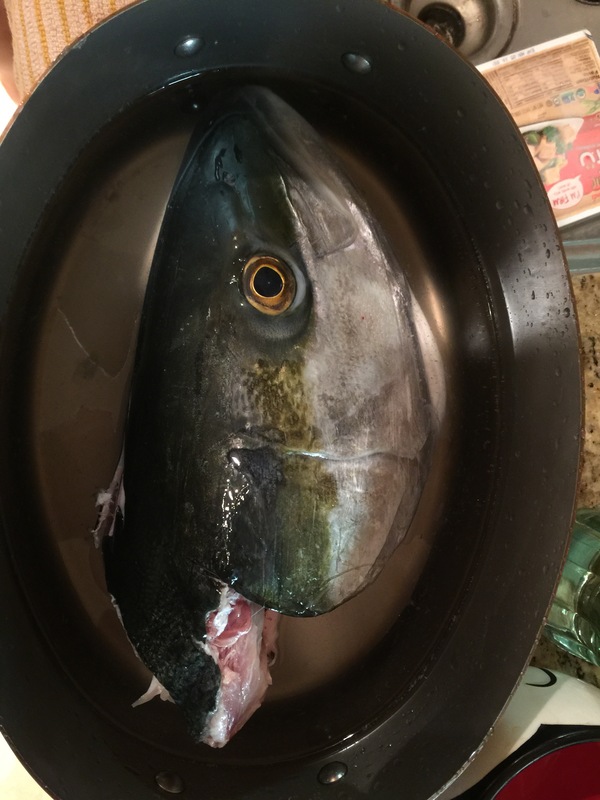 It’s Rosh Hashanah in our Sino-Yiddish household, so it must be time for Fish head soup. This amazing Yellowtail was caught yesterday by our neighbor Austin just offshore from our home here on the California central coast.